Character actor Nate Esformes died on June 19, according to the August edition of the WGA bulletin Write Now. By 1968, he had relocated to Los Angeles and his career began to take off in concert with the ascendancy of adventure shows that could make ample use of ethnically ambiguous villains: It Takes a Thief, The Wild Wild West, Mission: Impossible (which used Esformes five times), Ironside, The Six Million Dollar Man. Esformes also did multiple guest turns on Run For Your Life, The Flying Nun, Mannix, Police Story, and Hunter, and appeared in the mini-series Rich Man, Poor Man. 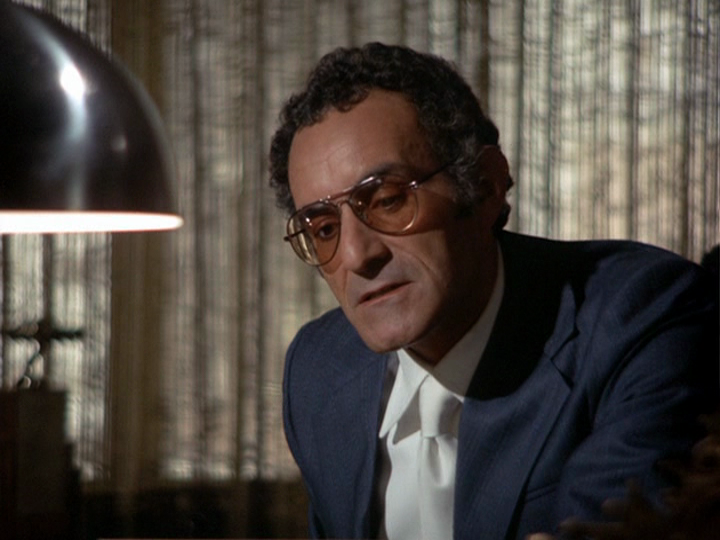 He played one of the Watergate burglars in All the President’s Men, and most of his other films have achieved either critical acclaim or cult fame: Petulia, Marlowe, Black Belt Jones, Henry Jaglom’s Tracks, Battle Beyond the Stars, Vice Squad, Invasion U.S.A. If you’re wondering why Esformes’s death was reported by the Writers Guild, it’s because he had a story credit on a single Naked City episode early in his career. That’s the only produced or published work by Esformes that I can find, apart from a 1983 Los Angeles Times story lamenting the closure of the famed Schwab’s Drug Store. In fact, I wasn’t able to produce much of anything else on Esformes, either – not a single profile or interview. That’s surprising, given how much we movie fans cherish our character actors. If anyone out there knew Esformes, here’s the place to tell us about him. Above: Esformes (right) with Jennifer West and Larry Haines in Hawk (“Legacy For a Lousy Future,” 1966). Top: Esformes in Kojak (“Close Cover Before Killing,” 1975).